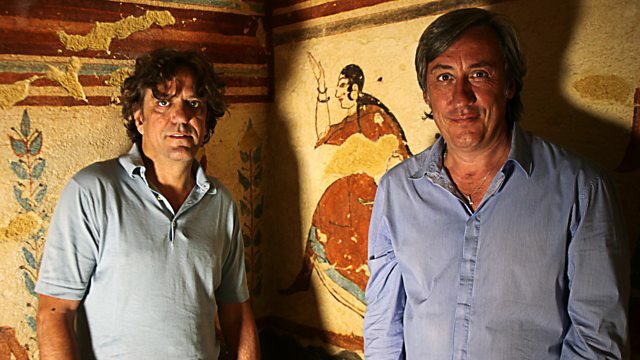 Andrew Graham-Dixon and Giorgio Locatelli's journey continues in Lazio. Avoiding Rome, the region's capital, they discover what lies outside the Eternal City. The second leg of Andrew Graham-Dixon and Giorgio Locatelli's journey down the west coast of Italy finds them in Lazio, a region whose capital Rome has always taken centre stage - but not this time. The two deliberately avoid the Eternal City and discover the legacy of those who took refuge away from the cauldron of city life and the politics of power and Popes. The gardens of the Villa d'Este boast some incomparable fountains, while the tombs of the Etruscans are a haunting reminder of the people who were here before the ancient Romans. Giorgio just has to visit the beautiful city of Viterbo, to find out more about the first papal conclave which he remembers learning about in school, and then it is time to treat Andrew to a meal fit for a pope with recipes from a historic cookbook. They end their trip in the south of Lazio at Latina, a glimpse into what Italy might have become if one man had got his way.